As a blogger, I receive a fair amount of PR spam–5-10 emails every day pitching crap I would never write about. And 9 times out of 10 this spam is illegal. It’s unsolicited commercial email in blatant violation of numerous provisions of the CAN-SPAM act. Day after day, week after week, the crap just rolls in, and frankly it pisses me off. Most of the time I just delete it and forget it. Recently, however, I started receiving spam at an email address I created specifically to keep “clean”, meaning I’ve never registered it anywhere or opted in for any list, though I have it posted as an “at dot com” address on my personal blog About page. So I started responding to the spam by asking where my name was sourced so I can get off the list. No one has ever responded to my request. Until today. Today, one spammer apologized and told me my clean email address was sourced from Cision and a product they call the Media Map. Interesting. After Tweeting about this discovery, I connected with a Vice President at Cision by email. I’m not going to publish her name or emails without permission, because I didn’t open the communication with the intent of entrapping her. But I will publish the gist of the email, because she’s a senior executive with Cision and a communications professional. I’m sure she can take care of herself, and I told her I would let her know when I posted this. My intent in writing this post is not to throw a bomb at Cision, but to open a public dialog about the practice of social media relations, and the behavior of Cision specifically. The executive assured me her intent was to be open and accountable and I take her at her word. Cision bills itself as “the leading global provider of media relations software services and solutions for public relations professionals.” Their homepage is full of social media products and services, and they offer a steady stream of webinars and whitepapers helping PR professionals navigate the brave new world of social media. So. To cut to the chase. Why is Cision harvesting my email from the web without permission, and providing it to PR agencies as part of a paid service to allow them to spam me with social media pitches? Call me crazy, but that doesn’t exactly jive with any notion of responsible social media marketing I’m familiar with. In fact, it sounds like Mercenary Marketing 1.0 cynically repackaged with a shiny Web 2.0 wrapper. When I asked these questions of Cision, the very polite response was, yes, they did “recruit” my email address from the web “prior to opt-in”, but they just hadn’t “gotten to the point” of asking me to opt in. They were, however, able to sell my address to PR agencies for the purpose of pitching me. At this point, by my reading of , this is illegal spam, although it’s a bit of a grey area. Cision is not emailing me, so they’re not sending spam. The PR agency is indeed spamming me–sending an unsolicited commercial email–but in all likelihood since they’re buying a professional service they’re under the impression it’s legit. One question I neglected to ask is whether Cision is representing the list I’m on as opt-in. I’ll let them answer for themselves. The Cision exec was also very polite in saying she’d be happy to note the names of any repeat offenders, but I told her that was unacceptable. Part of my annoyance with Cision is that it took me this long to figure out where my name had been sourced–which, if I were less charitable, I’d suggest was by design. The spam laws are clear that commercial emails must contain contact information and a way for recipients to unsubscribe. In none of the PR spam that I’ve received has there ever been an unsubcribe link or any mention of Cision. The only contact is the PR flack who wants to book an interview. This is not a transparent or accountable business practice on Cision’s part–and frankly, the responsibility cannot be pawned off on the poor naive agencies. Cision bills itself as “Helping Communications Professionals Navigate the Evolving Media Landscape”, and they are proud of the numerous webinars and whitepapers through which they educate PR professionals about the practical requirements of social media. But not one of their clients is following the most basic guidelines of responsible email marketing, not to mention the law? What does that say about Cision’s effectiveness as a social media leader? Fundamentally, I have no problem with Cision’s professed vision. There is a legitimate opportunity for someone to help agencies navigate the shifting media landscape. But in my experience, Cision’s practice doesn’t measure up. Whether they call it harvesting or recruitment, they collected my contact information and sold it to agencies, no matter how deeply it may have been embedded in a product or a service. They did not seek my permission, and they had no means of holding their clients accountable for the most basic legal and ethical marketing practices, whether or not they’re educating those clients through their webinars and whitepapers. However laudable their messaging may be on the subject of social media, they’ve treated me, the blogger, without respect. And in enabling PR agencies to continue the practice of unaccountable spamming, they have done no favors for their own market. I am far less likely today to pay attention to any email from a PR agency, which is a direct result of this experience. If you’re truly the social media leader you position yourself to be, this shouldn’t be any issue at all. Update: I’ve gotten a few emails, and a few comments below, directing me to other posts and comments online about similar experiences with Cision–and, frankly, similar platitudes from Cision about accountability and desire for “dialog”. There’s a pattern emerging, which you can clearly see , and . Someone calls Cision out for enabling spam, Mea Culpas ensue with perfectly played “openness and accountability” and yet Cision doesn’t change its behavior. The post you see here, including Cision’s careful self-defense wrapped in a “willingness to listen” are played out again and again, month after month making idiots of us all. So Heidi. C’mon back. Let’s have a real discussion about the game Cision is playing. I found this article after searching for distribution cision spam, a search prompted by a PR release for (I kid you not) a “Video Enhancing Service [that] Uncovers the Paranormal”. 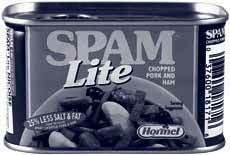 Spam is a scourge. The Cision’s of the world need to be stopped. I’d love to see Spam regulation flipped 100%, from opt-out to opt-in only.